Jorge Coppen’s new book “Bear Archery Traditional Bows: A Chronological History” is a creatively crafted and vividly illustrated manual for Bear Archery bow enthusiasts. Recent release “Bear Archery Traditional Bows: A Chronological History” from Page Publishing author Jorge Coppen is a comprehensive and fully illustrated reference manual for Bear Archery bow dating with much history covered as well. Jorge Coppen, a federal wildlife biologist for over twenty-five years, lifelong bow hunter, Bear Archery enthusiast, and author, has completed his new book “Bear Archery Traditional Bows: A Chronological History”: an informative, illustrated reference book preserving the history and heritage of Bear Archery. Published by New York City-based Page Publishing, Jorge Coppen’s illustrated reference manual is a great reference for all Bear Archery bow enthusiasts. 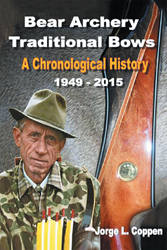 To the Bear Archery traditional bow enthusiast and to the archery community at large, this book "Bear Archery Traditional Bows: A Chronological History (1949–2015)" represents a singular compilation of the chronological history of Bear Archery traditional bow production through the Bear Archery Company’s full timeline. This illustrated reference manual not only preserves the history and heritage of Bear Archery traditional bow production since 1949, it serves as a helpful reference to any and all archers interested in collecting and dating their vintage Bear Archery traditional bows. Each chapter covers a detailed chronology of factory production specifications for each specific bow model or group of related models. It includes photos of bow models for almost every year. The best part is this: at the end of each chapter, there is a table that allows readers to search out the characteristics of their bow by year, AMO length, riser material, medallion, limb glass colors, overlay colors, limb tip colors and where applicable, the two-digit serial number prefix. Readers who wish to experience this educational work can purchase “Bear Archery Traditional Bows: A Chronological History” at bookstores everywhere, or online at the Apple iTunes store, Amazon, Google Play or Barnes & Noble.